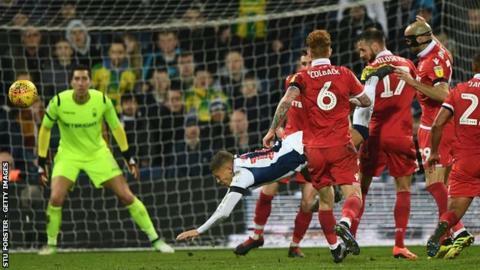 West Bromwich Albion head coach Darren Moore says top scorer Dwight Gayle's diving ban was taken out of context and did not take into account the speed and 'emotion' of football. The striker's late tumble in the box meant Jay Rodriguez was able to salvage a 2-2 draw against Nottingham Forest. But, within 48 hours, Gayle, 28, was given a two-match ban for "successful deception of a match official". "We're disappointed. All I'm after is some consistency," Moore told BBC WM. "In the context of the game, given the speed of the pass, the emotions and the timing of it, if we take all of that into consideration, when you play it back 12 hours later you're not going to get any of that. "The video won't give you that. They'll isolate the incident, with no voice on it - just replay, replay, replay and it will channel the incident one way. "They will not have seen the angle I had or the professional people on the pitch who understand the speed of the game." For any ban for 'successful deception of a match official' to be given by the Football Association, their three-person review panel has to reach a unanimous decision. After bringing in this ruling in March 2017, the first player to be punished by the FA was Carlisle United forward Shaun Miller seven months later. Everton's Oumar Niasse then became the first Premier League player to be similarly punished in December 2017, while West Ham's Manuel Lanzini was also charged soon after. Moore's main concern is the way Gayle's case has been treated in such isolation, when other similar-looking incidents have gone unpunished. "Since the ruling came in, if you tell me there's only been two instances I'd say you're mistaken," Moore. "I reckon there have been lots of incidents. "There'll probably be an incident this weekend as the game is played at such a tempo, with such energy and emotion. "Incidents happen. We've had games in which players of ours could have come off seriously injured, when the experts could have looked back at the video evidence. "We've never cried about that. We've just got on with it. And we stand by Dwight with this. "He's got a wonderful appetite for the game. He's enthusiastic, he's done wonders for us and we look forward to having him back for the Sheffield United game."